RIO DE JANEIRO - World swimming body Fina has cleared up the mystery over the water in a Games diving pool turning green overnight, attributing it to water tanks that ran out of certain chemicals used in the pool's water treatment process. "As a result the pH level of the water was outside the usual range, causing the discolouration, " it said in a statement on its website on Wednesday (Aug 10). "The Fina Sport Medicine Committee conducted tests on the water quality and concluded that there was no risk to the health and safety of the athletes, and no reason for the competition to be affected." Earlier speculation had suggested algae caused by humid conditions was the culprit for the odd sight at the Maria Lenk Aquatic Centres on Tuesday, which sparked heath fears that Games organisers swiftly dispelled. "The water quality...was tested and there were no risks to the athletes. We are investigating the cause," it tweeted. Games spokesman Mario Andrada later told the New York Times that a chemical imbalance had resulted in a "sudden decrease in the alkalinity" in the diving pool, which made the water change colour. Mr Andrada said that the sheer number of people using the pools over the past week, both for practice and during competitions, had changed the water's chemical balance. The problem, according to Mr Andrada, was made worse by ongoing rain at the venue. "We probably failed to note that with more athletes, the water could be affected," he said, adding that the pool's alkaline levels were improving and should revert back to its usual blue colour soon. Acknowledging that those in charge of the pool should have conducted more intensive tests, Mr Andrada said the organisers have since enlisted a team of independent experts for their own tests. 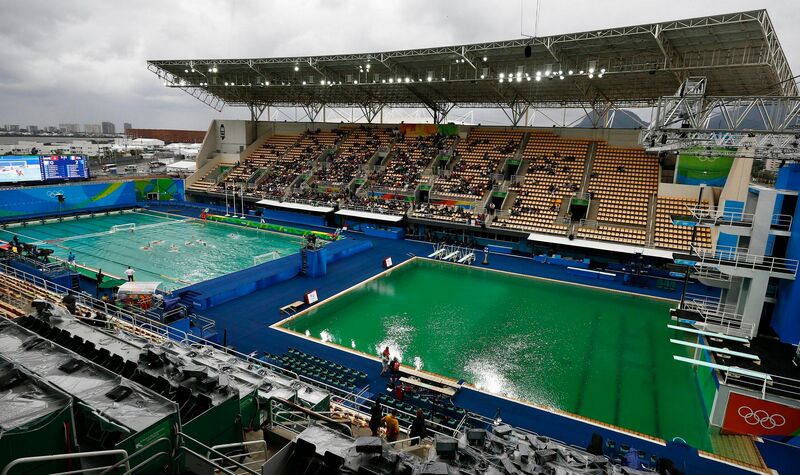 The sudden transformation of the pool's hue from aqua blue to swamp green - with a photo showing the stark colour contrast between the diving pool and an adjacent water-polo pool - went viral on social media. By Wednesday, the water-polo pool, the smaller of the two pools, had also started to turn green. Some athletes wondered if too much chlorine had been added to the pools. British diver Tom Daley got the ball rolling with a tweet captioned "Ermmm...what happened?!" that captured his confusion. US men's water-polo team captain Tony Azvedo told the Washington Post: ""I could barely open my eyes for the final quarter (in his team's match against France). This is the Olympic Games and they are putting so much chlorine in the water that people can't see. You can't have that." US diver David Boudia asked if it was a deliberate joke or an early St Patrick's Day celebration, while the Internet had a field day with their own theories of what exactly happened.